Some years ago, when Disney’s once-lustrous animation star had dimmed considerably, its glory days of Sleeping Beauty, Fantasia and Bambi well behind it, and uber-creative upstart Pixar nipping at its heels, you could have been forgiven for wondering if it would ever reclaim its place as one of the preeminent cinematic animators. That it has done so with films like Tangled and Frozen is a cause for celebration, but as their newest animation release Zootopia confirms in spectacular fashion, it’s come about largely on the back of solid, engaging storytelling, superbly well-sketched-out characters and imaginative artwork that makes the most of the genre’s many exciting possibilities. In other words, Disney got back to the basics and the animation hits, not surprisingly, came a-following (something it likely learnt from Pixar who appreciated that particular lesson from the get-go). If proof was needed that Disney has been paying, it’s Zootopia that is undeniably the best animated feature that Disney has produced in the modern era. From almost the first frame, when we see a young, enthusiastically gung-ho Judy Hopps (Ginnifer Goodwin) acting in a school play that extols the end of the adversarial predator/prey schism of old in favour of the modern everyone living in harmony ethos, the film barely puts a foot wrong marrying wit and intelligence and a brilliantly-articulated social conscience with breathtakingly immersive animation and characters who spring forth (in the case of Judy, literally) fully-formed from their first appearance. The film begins as it means to go, with Judy refusing to accept that a rabbit cannot become a member of the big animal-heavy police force of the faraway city of Zootopia – she lives in a small country town where her carrot farmer parents Stu and Bonnie Hopps, played by Don Lake and Bonnie Hunt, extol the virtues of “settling” and only having dreams if you don’t intend to act upon them – and encouraging anyone who’ll listen that no one should be limit from expectation or prejudice. It’s a heady, well-realised message that percolates through the entire length of this intelligently-crafted film which, while it gives us kooky characters such as the lovable, obese cheetah Officer Benjamin Clawhauser (Nate Torrence) who adores popstar Gazelle (Shakira), uses its humour judiciously (and yet still generously) in favour of actually having something to say. Refreshingly, its message, which takes aim at the idea that you are limited by what people think of you and can never rise above expected role or grimy, bottom-feeding prejudice, is woven deftly and convincingly into the narrative. At several key points such as when Officer Judy Hopps first meets Clawhauser and corrects him when he calls her “cute”, reminding him that only other bunnies can use that term, or when she tries to convince her unwilling accomplice in crime-solving and later friend and partner fox Nick Wilde (Jason Bateman) that he can rise above the idea that foxes are shifty and untrustworthy, Zootopia bravely challenges perceptions and stereotypes in ways that are inspiring and uplifting and anything but clumsily politically-correct. It isn’t hard to keep cleverly, and subtly, hammering the message home since at every turn in the gloriously animated city of Zootopia, where animals live in a fascinating array of habitats from Tundra Town to Savannah Square and Rodentia (quite possibly the cutest animal habit of the lot), Judy, Nick and a number of other characters such as deputy mayor, sheep Dawn Bellwether (Jenny Slate) encourage prejudice (the precursor sadly to outright racism, or speciesism in this instance) in forms large and small. 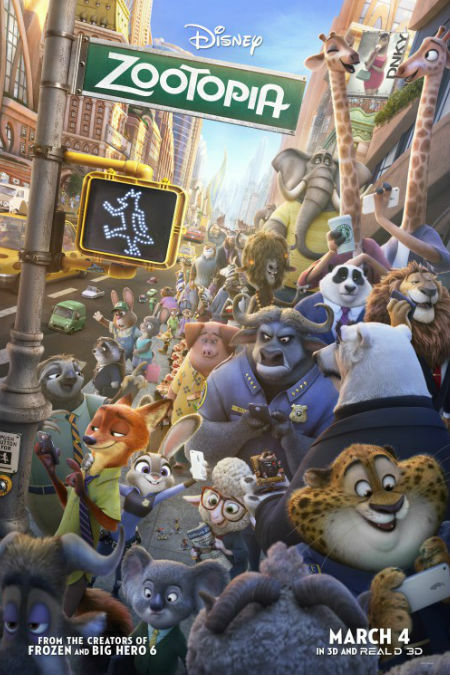 Only the bigger animals such as buffalo, rhinos, elephants and tiger make good police officers (Chief Bogo is a cape buffalo played by Idris Elba), a lion such as Mayor Braveheart (J. K. Simmons) make perfect leaders, and rabbits and foxes can never rise above their respective stations. Judy and Nick have vastly differing responses to this ingrained prejudice, which persists even after years of cosy habitation between predator and prey, with the police force’s most enthusiastic new recruit refusing to let it define her (for the most part at least; there are moments when her indefatigable joie devivre flags for obvious reasons); Nick however, a pretty hustler, feels he has no choice but to confirm to the negative, pejorative-laden image most, if not all animals, have of foxes. Throughout Zootopia, these life-aspirational views are roundly challenged at every turn as Judy sets out to solve a major crime – a motley array of predators are disappearing after going “savage” and acting out of character – intent on proving to Chief Bogo, Mayor Lionheart and a host of others that not only can rabbits be stellar police officers but they can positively change Zootopia for the better. In every respect, Zootopia is a brilliant achievement. The animation for instance is beyond superlative. It’s hard to recall world building as effortlessly and immersively done as the city itself, all towering spires, vastly different ecologies that are realised with the kind of detail that makes your inner child squeal with joy – one main form of transport in Tundra Town are canals upon which everyone ride on mini-ice floes – and scenes of everyday life that install the urban landscape as a living, breathing character well on par with the animals that inhabit it. The characters too are so well-written that they arrive fully-formed with only a word or two or a telling facial gesture needed to establish who they are and why they matter. This extends as much to the minor characters such as the enchantingly goofy, hippy-esque Yax (Tommy Chong) who is the owner of the naturist club Mystic Springs Oasis and Godfather-like Mr Big (Maurice LaMarche), the most feared crime boss in Tundra Town as it does to the likes of Judy and Nick. The attention to detail even extends to some fantastic pop culture references including the selling of bootlegged Disney movies with animal-esque titles by petty criminal Duke Weaselton (Alan Tudyk), an hilarious exchange between Chief Bogo and Hopps which concludes with him telling her that life isn’t like a cheery musical and she should just “let it go” (cough – Frozen) and a train scene straight of Speed that nicely establishes how close the rapport between Judy and Nick has grown. Zootopia is the kind of near-perfect film about which it is highly possible to rhapsodise forever – every last frame of animation, line of dialogue, character interaction and narrative moment is executed with great thought, intelligence and good humour and as it ends you can help that it could go on forever. The world may not be like Zootopia in many respects, especially with the kind of extremism the film roundly and deftly condemns on the rise seemingly everywhere, but by this end of this most remarkable and inordinately-satisfying of animated movies, you will heartily wish it could be. Copyright All rights reserved | Theme: Flash Blog by Unitedtheme.